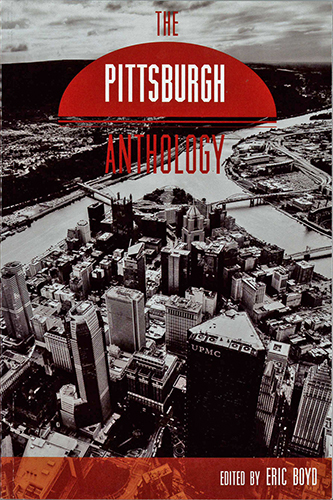 Made up of essays, poems, short stories, and visual and graphic artwork with Pittsburgh connections, “The Pittsburgh Anthology” is one of a number of Midwest city anthology books that capture varied and eccentric viewpoints from its citizens in the present. This is not a typical compilation about Pittsburgh. Many authors and artists may not be familiar to readers, but their viewpoints are no less relatable and intriguing. In Pittsburgh, there is always something or someone new to learn about, and each chapter of this book introduces the reader to one of them. The black and white golden triangle photo dominating the cover is taken by local photographer Dave DiCello, who captures some of the most stunning and vivid photos of the city today. Though featured here with such dull treatment, this photo gives the impression that the city has not moved on, that it’s static and old despite Boyd’s wish for a fresh perspective of the Point. I feared that what the book contained would follow suit, that is, until I read stories like “From the Diaspora” by Bethany Lang, who demonstrates how much Pittsburghers love to talk about Pittsburgh, and a graphic novel-esque chapter by J.J. Lendl called “The T to Nowhere” that hilariously captures the frustration of the limited service of the light rail system in the South Hills. One surprising part of the book came toward the end with Robert Gibb’s poem “Steelworkers’ Lockers, Pittsburgh History Center” that, for obvious reasons, caught my attention. I know these lockers well since I cataloged them long ago in my days as an intern. His description of the “forlornness of metal” conjured up memories of both my past and that of those who actually used the lockers. Pittsburgh’s resilience and ability to retain its character makes it a rust belt city and “The Pittsburgh Anthology” is well suited for a new generation of Pittsburghers who are not so far removed from the city’s past. Pittsburg is NO in the mid-west and a lot of us are insulted when you call it that. It is back east or mid-atlantic. Western Pennsylvania History has presented scholarship for a broad audience since 1918. 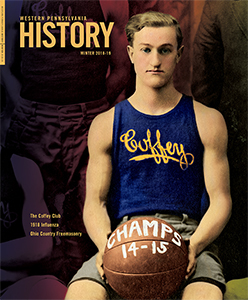 As the region’s oldest continually-published magazine, History Center members receive a free subscription to this award-winning quarterly publication. The magazine provides exclusive online book reviews to complement each issue.